Movie remaking should be allowed or not, is a million dollar question (literally:)). Let us talk only in the aspects of Indian films, specifically Bollywood movies. At one end we see some movie disasters like “Ram Gopal Verma Ki Aag” (remake of “Sholay”) and “Zanzeer” (remake of “Zanzeer” starring Amitabh Bachchan and Pran); on the other end there are films like “Mother India” and “Devdas” which are even more successful then its originals. There is a group of movies, which got moderate success like “Agneepath” (remake of “Agneepath” starring Amitabh Bachchan and Danny) “Chashme Buddoor” (remake of “Chashme Buddoor” starring Farooq Shaikh, Deepti Naval and Rakesh Bedi). Of course, all these lists are long. But the assessment says that if the movie is made with proper efforts (i.e. it shouldn’t look like spoof or parody of original), given proper treatment and if the subject is fresh and its contemporariness is not compromised; then it can appeal the viewers for sure. Adding to the list, there is one more movie released in recent past – Hero. It is official remake of Jackie Shroff, Meenaxi Sheshadri starring masterpiece of the same name by ace film maker Subhash Ghai. Hero (released in 2015) is the launch-pad for two star kids Athiya Shetty (daughter of Suniel Shetty, who is known for his gentleman qualities) and Sooraj Pancholi (son of Aditya Pancholi, who is often part of controversies). The remake follows almost the same story, which is made more visually appealing and some stuffs are changed to fit in the current times. However the contemporary-ness of the story is not much and hence it fails meeting the appeal of the original film. Nothing much is changed in terms of the story from the original film. Radha, daughter of IG of Police and sister of a police inspector is happy-go-lucky girl. She is enjoying her life and is never introduced to difficult realities. She is a little high-head too. Sooraj is a carefree youth. Being an orphan he was raised by a criminal named Pasha. He was introduced to the world of crime at the early age. Obviously he is often involved in fights and gang rivalry. Pasha was in a custody and if he was presented to the court along with the evidences, he will have to face a tough punishment. He calls in Sooraj to abduct Radha and thus putting pressure on IG Mathur to behave under his influence. Sooraj does his job. However while spending time with Radha, he actually falls in for her. So will he tell the truth to Radha? Will he try to be a good man? Will Radha’s family accept him? Will Sooraj give away Pasha who was like father to him? Will Pasha not be angry on him? Are there any more hurdles in the love-bird’s way? Will the criminal be free without punishment? It is good to explore. If we talk about the performances, Sooraj is trying hard. He looks convincing in some actions scenes too. But overall he fails creating the impact needed. He no doubt has potential and with more experience he will be a challenge for many of his co-actors. Athiya has good screen-presence. She looks her character and have acting abilities too. It would be interesting to see her as a mature actress in coming future. It would be right to say that both the new comers tried to grab the opportunity they have given, with open hands. Sharad Kelkar is effective in small role and so does Anita (as his wife). Tigmanshu Dhulia is good actor and tries well, but he doesn’t look effective in this film. He surely fails in creating the charisma of Shammi Kapoor in the original film. Aditya plays his part with sincerity. He slips into his character effectively. Vivan in effective in some of the scene and gives competition to seasoned actors pretty well. Though, his role could have been written better. Rest of the cast members does their work with moderate efforts. The music of the movie fails to create the impact the original film made. 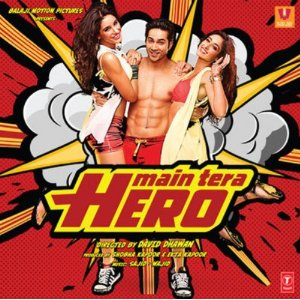 The song which clicks the most is the title song – Main Hoon Hero Tera. It is sung and picturized in fantastic way and is the best song of the album. Yadaan Teriyan is trying to revive the magic of Lambi Judaai from the original movie. It doesn’t live up to the expectations though. Dancing Floor Ke Legend is filmed pretty well. The lighting effects and some of the dance steps are also cool. Though you will forget the song soon. Oh Khuda – is good on ears. It pleases you in terms of music and lyrics both. When hearing in surround sound, you will definitely enjoy it. Jab We Met – is easily forgettable. You will like to see on screen for once or twice though. The background music is very effective and in most of the cases it adds positive to the scenes. We have already talked about the performances, so let us not repeat it. The movie heavily relies on the visual aspects and in most of the cases it is of good quality. Be it the usage of lights in songs like “Dance floor” or the locations of Kashmir (as mentioned in the film); the quality is taken care of. The producer spent remarkable amount of money to make the movie an appealing experience and it is evident on screen. Though, we wish, the same could have been said for the story and screenplay. High-octane stunts look fantastic on the screen. Though one must remember that the facial expressions are even more important in action scenes. Why otherwise, Amitabh Bachchan is successful as Angry-Young-Man?! If the script was tighter and the makers could have taken risk to update the story to be more thrilling and effective; the movie could have been much better. Just showing cell-phones and projecting the female protagonist as a fan of taking selfies; doesn’t add the required contemporariness to the movie. The dialogs are good at places. The movie is good in technical aspect. The newcomers tries performing well and we see potentials in them. However the movie could have been written and executed in better ways. Not a master-piece definitely. You can enjoy watching it once or twice; may be on Home Entertainment media. While we consider the movie a visual delight, and worth watching once; despite of many short-comings of the same; what do you think? We would like to hear your genuine thoughts and comments about it. And yes, do not forget to share this article with your friends over various social networks via Twitter, Facebook, Google Plus and others. And yes, you may like to subscribe to our RSS feeds and follow us on various Social networks to get latest updates for the site to land right in your mail box.